For the 1968 album, see Safe at Home. 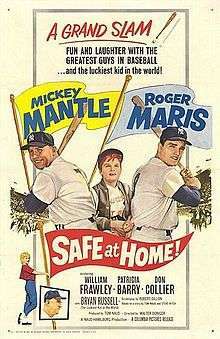 For the 1985 sitcom, see Safe at Home (TV series). Safe at Home! is a 1962 sports comedy film starring Major League Baseball players Mickey Mantle and Roger Maris of the New York Yankees. The film also stars William Frawley and Don Collier, with appearances by New York Yankees Whitey Ford and Ralph Houk. The film is about a young Florida boy who lies to his Little League teammates, telling them he knows Mantle and Maris and will bring them to their team banquet. His attempts to meet his heroes during spring training by sneaking into the stadium and into their hotel room at the Yankee Clipper Hotel result in chaos, and he learns an important lesson about honesty. Filmed in Fort Lauderdale and Pompano Beach, Florida.